This photo is beautiful. I didn’t know what it was at first, but then (like the smarty I am) I read the title. And then I shuddered, because tadpoles creep me out. I’ve tried to love them, but they are strange. Just look at them. Really big tadpoles creep me out the most. These are small ones. Some might call them cute. Also, the water looks like epoxy, which is cool. Thank you Dana, your response made me laugh! There is something a little creepy, it’s true, and the dead fly doesn’t help. I like big tadpoles, though, when they’re just getting legs. Epoxy is just right. What an extraordinary photo – almost surreal, or like something by Richard Dadd. Beautiful. 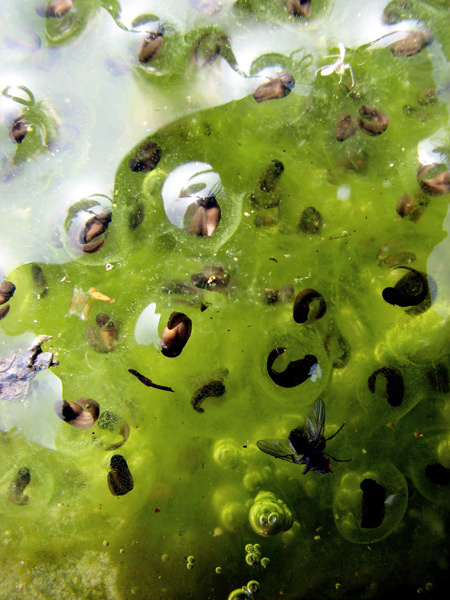 I love tadpoles at all stages, and this photo especially. It’s so…elemental, and also abstract. Little squiggles of life emerging from green goo. Wonderful.